Phnom Penh (FN), Feb. 18 - Ministry of Justice spokesman Kim Santepheap stated Monday that the US Embassy Phnom Penh did not respect Cambodia’s sovereignty and independence and that the Embassy intended to distort and mislead the legal procedures of Cambodian court concerning the legal case of Kem Sokha, former leader of opposition party. 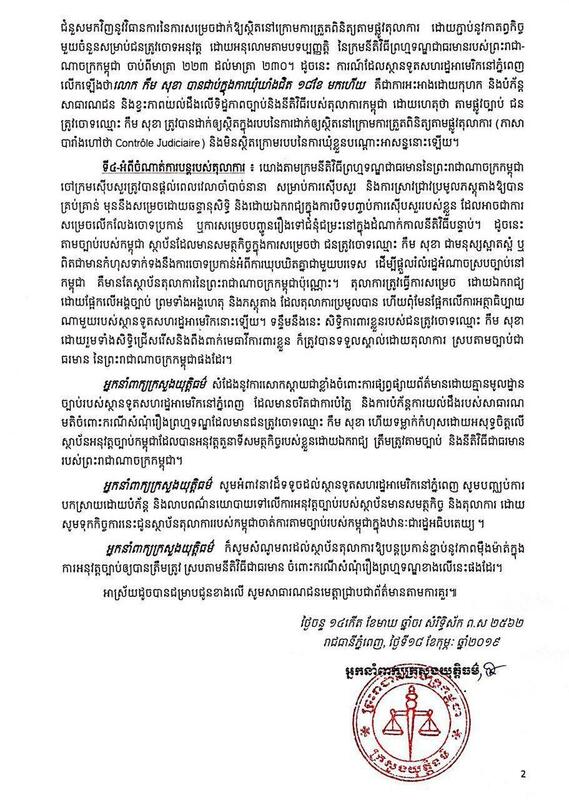 Ministry of Justice’s statement was made in response to US Embassy’s statement that defended the accused Kem Sokha, allegedly charged with conspiring with foreigners to topple the legitimate government of Cambodia. “Kem Sokha is an innocent man, being held unjustly under false pretenses. There is no evidence against him, and no trial date has been set. No evidence. No trial. No justice,” the US Embassy Phnom Penh wrote on her Facebook on 15 February 2019. Cambodian Ministry of Foreign Affairs and International Cooperation also expressed grave concern over such a conduct and categorizes the move as undiplomatic and disrespectful for the sovereignty of Cambodia, according to the statement dated late Saturday. 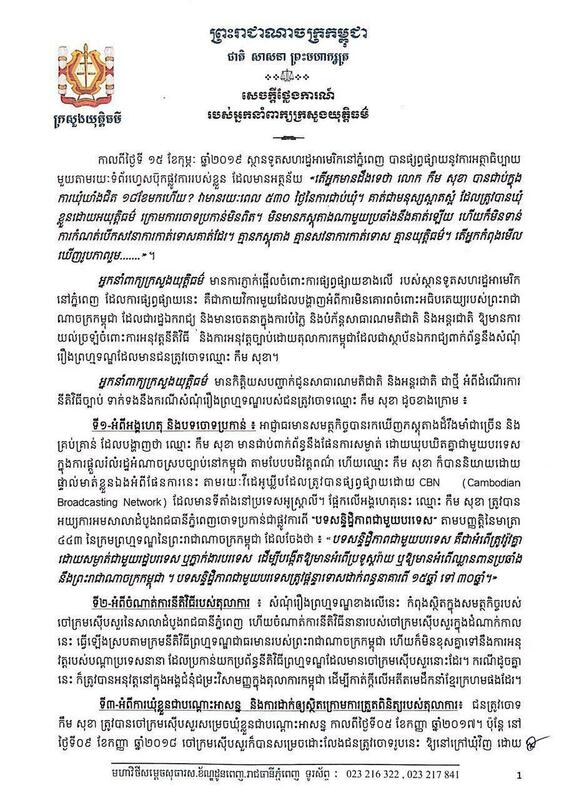 “The Ministry is compelled to remind the US Embassy in Phnom Penh to refer to Article 41 of the Vienna Convention on Diplomatic Relations of 1961, which particularly requires the Mission to respect the laws and regulations, and not to interfere in the internal affairs of Cambodia,” the statement continued. “The Kingdom of Cambodia always respects the sovereignty of other nations and has not commented on any disgraceful scandal of any senior officials and politicians of any country. The step taken by the US Embassy in this biased direction runs counter to the ongoing efforts of the two nations in improving the bilateral relationship for shared interest of the two countries and peoples,” the ministry wrote.